We will be back in February with our January 2017 statistics. Hope everyone is enjoying the new year! In November, we saw some changes in the Oldham County real estate market. Let’s dive into our findings. The absorption rate for the month of November was 4.7 months of supply (205 active listings), the same absorption rate as October. The absorption rate has dropped since November 2015 which had an absorption rate of 5.28 months of supply (245 active listings). Currently, Northern Oldham County could be categorized as having a balanced market (three to six months’ worth of inventory). The months of inventory refers to how long it would take to sell only the current listings if no other homes were listed at the time. A balanced market means that the real estate market has a balanced amount of homes on the market. A balanced market does not favor buyers or sellers. The average list price increased from $474,966 in 2015 to $558,775 in 2016. The average list price of $558,775 may seem high to some; however, there were several homes over a million dollars listed in the month of November, making the average list price increase quite a bit. Also, the number of homes sold increased from 30 homes sold in November 2015 to 42 homes sold in November 2016. The greatest number of homes sold was in the $200,000 to $249,000 price range. The average cumulative days on market has decreased from 100 days on market in November 2015 to 77 days on market in November 2016. The absorption rate in South Oldham County has decreased to 2.34 months of supply (3.3 months of supply in October 2016). The absorption rate has also decreased drastically from November 2015 (3.77 months of supply). This absorption rate indicates that Southern Oldham County is still in a seller’s market. The average list price has increased from $384,529 in November 2015 to $491,744 in November 2016. Although the average list price has increased substantially, the average sale price has not. The average sale price in November 2015 was $260,982 and $262,812 in November 2016. This is due to many high-end homes being listed but not selling. The most common price range for sold homes in November 2015 and 2016 was $200,000 to $249,999. The average cumulative days on market decreased from 91 days in November 2015 to 63 days in November 2016. We hope everyone had a wonderful Christmas! Check back next month for December 2016 real estate statistics. 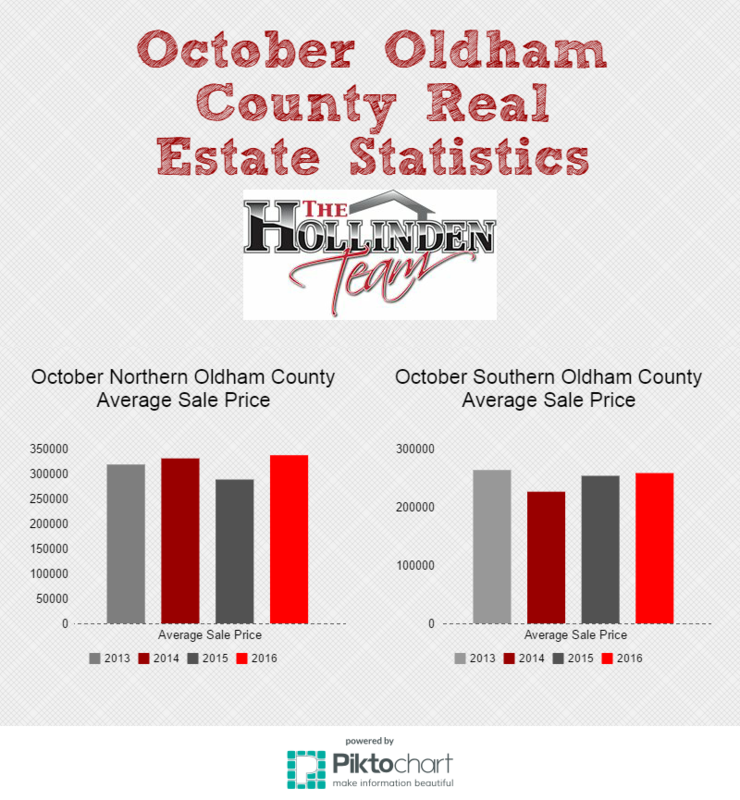 We have the October Oldham County real estate statistics ready for you! Now that we have moved into the fall season, let's see if there have been any changes in the Oldham County real estate market. The average absorption rate (average months of supply) has increased just a little from 4.72 months of supply in September 2016 to 4.89 months of supply in October 2016. Inventory is still not quite as high as October 2015 with 5.67 months of supply. Inventory is steadily increasing from the low supply we saw this summer (a little over three months of supply). Although inventory is increasing, our current market conditions could still be considered a seller’s market. The number of active listings demonstrates the lower inventory in October 2015 (249 active listings) to October 2016 (217 active listings). Also, there were 34 listings sold in October 2016 and 51 listings sold in October 2015. In October 2016, we saw the average sale price increase to $336,659 from a $287,960 average sale price in October 2015, making a 16.91% increase. The average list price in October 2016 was $556,431 versus $479,430 in October 2015. The absorption rate has steadily increased from the spring and summer of 2016. Right now, Southern Oldham County has about 3.3 months of supply, making it a seller’s market. This past spring and summer, there was a little over two months of supply, which is very low. In October 2016, we saw an average list price of $309,532, an increase from the average list price in October 2015 of $257,890. What were homes selling for in the month of October? The average sale price in October 2016 was $198,527, an almost $10,000 increase from October 2015. 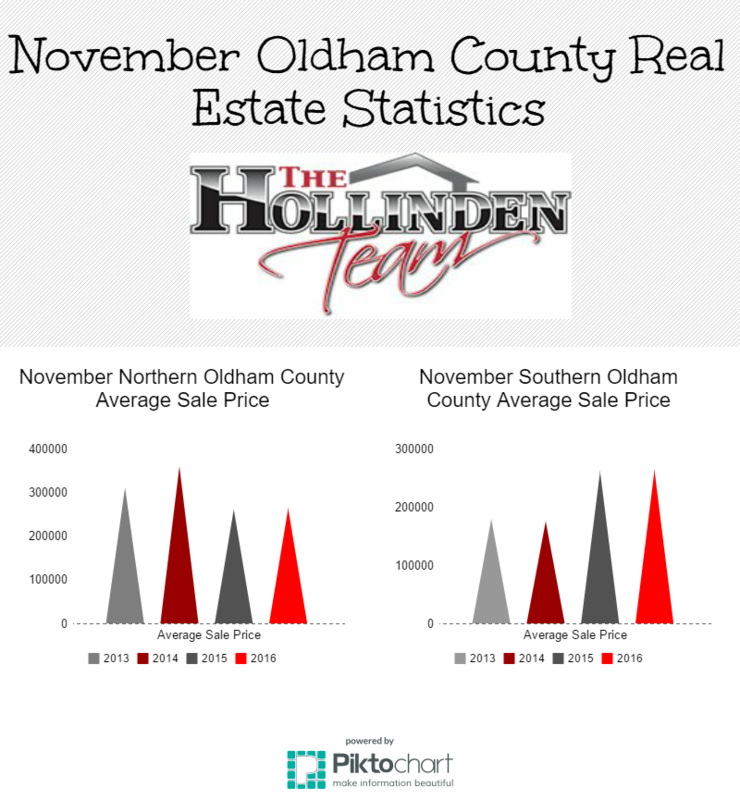 November Oldham County real estate statistics will be coming to you soon! Check back in early December to see our findings. The average list price has increased quite a bit from $496,862 in September 2015 to $555,084 in September 2016. The average sale price has actually dropped in the past year from $308,730 in September 2015 to $290,707 in September 2016. Not only has the average sales price dropped from this time last year, it has also dropped in the last month. The average sale price in August 2016 was $345,691. Average cumulative days on market has actually increased from 75 days in September 2015 to 124 days in September 2016. Ironically, the absorption rate was lower at 5.92 months of inventory in September 2015 and 4.72 months of inventory in September 2016. I would think that if the absorption rate was lower this year than the cumulative days on market would be lower because the demand would be higher. Luckily, inventory is increasing from this summer to now. If you were shopping for a new home this summer, you had firsthand experience with the low housing inventory. There was a total of 43 sold listings in September 2016 and 50 in September 2015. In September 2016, the most popular price range for homes sold was $200,000-$299,999. In September 2015, the most popular price range for homes sold was $250,000-$299,999 and $500,000 and above. There was a total of 210 active listings in September 2016 and 258 active listings in September 2015. The average list price in September 2016 was $466,914 and $392,814 in September 2015. The average sale price has increased from $265,325 in September 2015 to $288,981 in September 2016. The average cumulative days on market was 112 days in September 2015 and 46 days in September 2016. Months of inventory has decreased a little bit from four months of inventory in September 2015 and 3.07 months of inventory in September 2016. Compared to Northern Oldham County, there are quite a bit fewer homes on the market in Southern Oldham County. A total of 44 homes sold in September 2016 which was the same number of homes sold in September 2015. Check back in next month for the October 2016 Oldham County real estate statistics. The average list price in Northern Oldham County in August 2016 was $566,020. This is an increase compared to an average list price of $479,717 in August 2015. There was also a small incline in the average sale price from $337,087 in August 2015 to $345,691 in August 2016. Compared to the average sale price in June 2016 of $208,836, this is a significant change. Average cumulative days on market has decreased from 95 days on market in August 2015 to 72 in August 2016. The absorption rate has also decreased from 6.1 months of inventory in August 2015 to 5.14 months of inventory in August 2016. Absorption rate is the number of houses that are available in a particular real estate market during a given period of time. However, in June 2016 we saw only 3.4 months of inventory. Inventory of homes was extremely low this summer so this goes to show that more homes are going on the market. There was a very small decline in homes sold with 48 homes sold in August 2015 and 41 homes sold in August 2016. There were a few more active listings in August 2015 (271 actives listings) compared to August 2016 (230 active listings). Southern Oldham County saw an increase in average list price from $383,169 in August 2015 to $452,112 in August 2016. Average sale price from August 2015 to August 2016 didn’t show much change. In August 2015 the average sale price was $256,179 to $266,318 in August 2016. The average sale price in June 2016 was $482,712, making a significant decline in August 2016. In August 2016, Southern Oldham County average cumulative days on market was 66 days, increasing by 18 days compared to August 2015. The absorption rate was 3.12 months of inventory in August 2016 and 3.71 months of inventory in August 2015. This is significantly less inventory compared to 5.14 months of inventory in Northern Oldham County. There were 58 homes sold in Northern Oldham County in August 2016 which wasn’t much different from 2015. The average list price in Northern Oldham County in June 2016 was $305,485. Compared to June 2015 average list price of $257,594, we have seen an 18.59% increase. However, the average list price has actually decreased from May 2016. In May 2016 the average list price was $573,209. The average sale price in Northern Oldham County in June 2016 was $208,836 compared to $205,571 in June 2015. This is quite a decrease compared to May 2016 average sale price of $370,449. In June 2016, we saw a decrease in cumulative days on the market compared to June 2015. In June 2016, the average cumulative days on market in Northern Oldham County was 60 days compared to 81 days in June 2016. There was also a decrease in absorption rate in June 2016 versus June 2015. Absorption rate is the number of available homes in a specific real estate market during a given period of time. In June 2016 we saw 3.4 months of inventory versus 4.8 months of inventory in June 2015. In June 2016, 32 homes sold in Northern Oldham County. This is very comparable to the 39 homes sold in June 2015. There were 111 active homes on the market in June 2016 versus 139 homes on the market in June 2015. 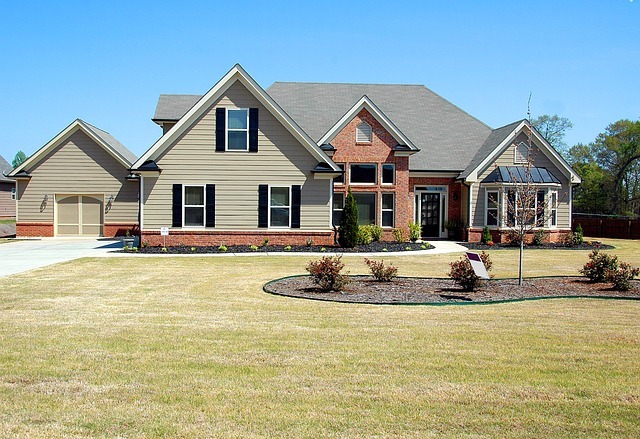 This is a -20.1% decrease in homes on the market in June 2015. The average list price in Southern Oldham County in June 2016 was $432,678 compared to $377,002 in June 2015. Although it may seem like the average list price is going up, it is actually decreasing. In May 2016, the average list price was $482,712. The average sale price in Southern Oldham County in June 2016 was $305,290 compared to $281,627 in June 2015, making an 8.40% increase in sales price. There was a pretty significant decrease in absorption rate in June 2016 versus June 2015. We saw 2.83 months of supply versus 3.43 months of supply in June 2015, making it a -17.49% decrease in supply. The number of sold listings in Southern Oldham County in June 2016 was pretty comparable to June 2015 with 74 sold listings in June 2016 versus 66 sold listings in June 2015. What is absorption rate? Absorption rate is the number of available homes in a specific real estate market during a given period of time. The calculation for absorption rate is the number of homes sold in a time period divided by the number of months. Typically, we look at the previous 12 months and divide by 12. This will give you your rate of home sales. Next, divide the number of active homes by rate of home sales. This will give you your absorption rate. Absorption rates are a great tool for REALTORS to determine the best sale price for a property. Since May 2015, Northern Oldham County has experienced a steady drop in absorption rate. Between May 2015 and May 2016, North Oldham County has a total of -36.98% change in absorption rate. South Oldham County’s absorption rate stayed between three to four months from June 2015 to December 2015. From January to May 2016, South Oldham County has had an absorption rate of around two months. From May 2015 to May 2016, South Oldham County has a total of a -24.43% change in absorption rates. The big drop in absorption rate is largely based on the lack of inventory in Oldham County. In fact, most counties in Kentucky are experiencing record low inventory. It will be interesting to see if absorption rates remain low throughout the rest of the year. For information on the current conditions in the Louisville real estate market, check out our blog. The average list price in Northern Oldham County in May was $573,209, a little bit of an increase from April’s average list price of $564,515. Although the average list price may seem high, there is a good balance of homes in every price range located in Oldham County. Right now, there are several homes listed over $1 million dollars in Oldham County. These homes have fluctuated the average list price quite a bit. The average sale price for May was $370,449 which is a 6.84% increase from May 2015. The average cumulative days on market in Northern Oldham County has decreased from May 2015 to May 2016. In May 2015, the average cumulative days on market was 161 versus 90 days in May 2016! The absorption rate has decreased with a 3.97 months supply in May 2016 versus a 6.3 months supply in May 2015. In total, 51 homes sold in the month of May. This is a little bit of a decrease compared to the 59 home sold in May 2015. However, there was a significant decrease in the number of homes listed for the month of May 2016 versus May 2015. In May 2016, 70 homes were listed in Northern Oldham County while 120 homes were listed in May 2015! That is a -41.7% decrease in homes listed. This goes to show even more how low inventory is in the real estate market. The average list price in Southern Oldham County in May 2016 was $482,712. This is a significant increase compared to May 2015 and last month! In May 2015, the average list price in Southern Oldham County was $383,967, a 25.72% change. Last month the average list price in Southern Oldham County was $457,728. The average sale price in Southern Oldham County was $340,615. Again, this is a significant increase compared to April 2016 and May 2015. In April 2015 the average sale price was $260,898 and $245,176 in May 2015. As you can see, home prices are on the rise! The absorption rate is pretty comparable to April 2016. Right now, Southern Oldham County has about 2.63 months of inventory. The absorption rate is declining compared to May 2015 which had an absorption rate of 3.52 months. The number of sold listings in Southern Oldham County in May 2016 is pretty comparable to Northern Oldham County at 55 sold listings. May 2015 had just a few more homes sold. In May 2016 there were 78 new listings in Southern Oldham County and 95 new listings in May 2015. 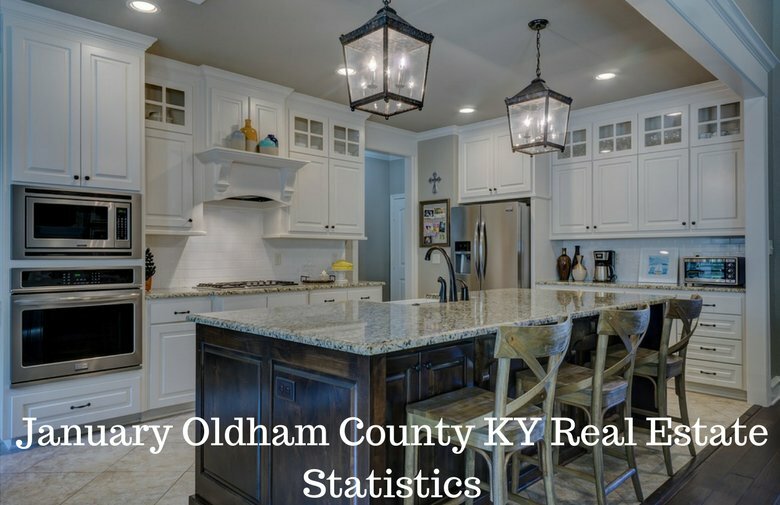 Are you curious to know the most recent real estate statistics for Oldham County? April continued the brisk sales of homes in Oldham County. Focusing on Northern Oldham County real estate market conditions this year versus last year, we saw the absorption rate drop to 4.4 months from 5.9 months of supply. Absorption rate is when homes are purchased in a particular area during a time period. We saw the average list price in Northern Oldham County increase to $564,515 from $494,763. Surprisingly, the average price of homes sold dropped dramatically to $282,434 from $457,584. Oldham County’s sold to list price ratio has increased to 96.5%. One of the most noticeable statistics is Average Cumulative Days on Market (CDOM). In Northern Oldham County, the CDOM dropped in half from 176 days in 2015 to 85 in 2016. Wow! So what about the number of homes sold in Northern Oldham County? 649 homes sold in Northern Oldham County this April versus 43 last April. Pending listings were almost the same at 65 and 66. We had fewer listings this year than in 2015 with 72 compared to 118 last year. Real estate agents complain about the lack of inventory and the active listings number supports this. In 2016, Oldham County had 207 active listings in April on the MLS versus 241 a year ago. The year to date stat for Northern Oldham County reinforces the trend. There have been 147 sold homes in Northern Oldham County this year versus 108 in 2015. Sellers know this market is hot and new listings are up a little bit with 197 new listings versus 177 last year. In Southern Oldham County this April versus April 2016, we saw the absorption rate drop to 2.6 months from 3.3 months of supply. We saw the average list price in Southern Oldham County increase to $457,728 from $376,002. Unlike Northern Oldham County, the average price of homes sold decreased a little to $260,898 from $274,300. The sold to list price ratio in Northern Oldham County has increased to 97%. One of the most noticeable statistics is the average Cumulative Days on Market in Southern Oldham County (CDOM). The CDOM dropped in half from 122 days in 2015 to 91 in 2016. So what about the number of homes sold in Southern Oldham County? In Southern Oldham County, 42 homes closed in April versus 45 a year ago. Pending listings were almost the same at 64 and 66. 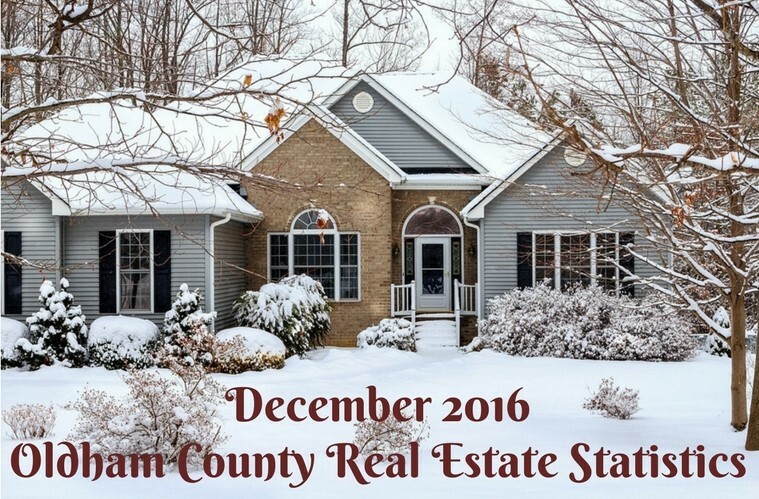 We had fewer new listings in Southern Oldham County this year than in 2015 with 70 compared to 83 last year. In 2016, there were 116 active listings in Southern Oldham County in April versus 140 a year ago. There have been 153 sold homes this year versus 143 in 2015. There has not been a noticeable change in listings this year versus last year with 217 new listings versus 222 last year.